This shows vegetable and fruit carving and presentation suggestions for the various garnishes created, plus decoration of entree, main course and side salads. It also includes an impressive method of decorating large salad bowls. Garnishing 1 & Garnishing 2. The perfect program for beginners. They contain everything a chef / cook or food lover needs to know about presenting food ensuring it always looks appealing and impressive. Using the food you are serving to create garnishes, producing the garnishes quickly and with little waste. This shows greater detail and more advanced presentation work. 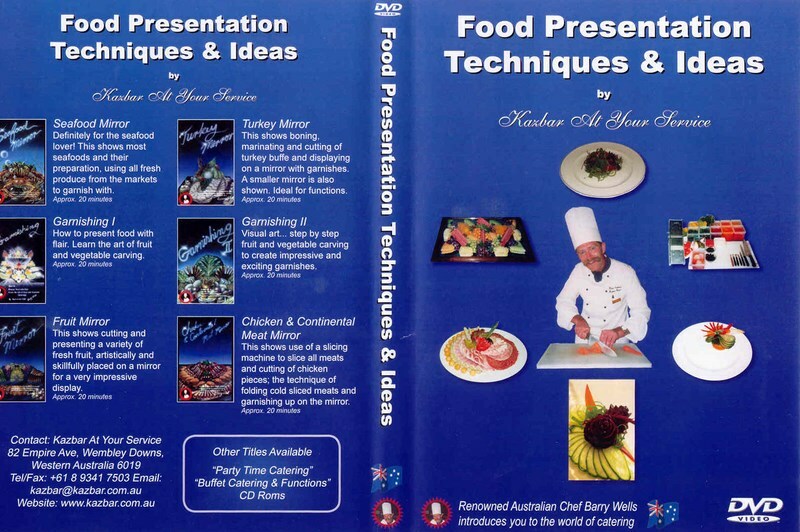 This DVD / VHS Program, or the set, are often a very welcome gift for the apprentice chef or the enthusiastic cook. This program shows the construction of a prawn fountain, decoration of prawn platter. preparation of crayfish, cutting of lemon wedges. Placing of various fish and seafood, including crab, smoked salmon, mussels, squid, oysters, whole baked snapper, and utilises most of the garnishes shown on Garnishing I & II - using all fresh produce from local markets. This shows cutting and presenting a variety of fresh fruit, artistically, and skilfully placed on a mirror for a very impressive display. Great to add to your next menu. This shows boning, marinating and cutting of turkey buffe and displaying on a mirror with garnishes. A smaller mirror is also shown. Ideal for functions. This shows use of a slicing machine to slice all meats and cutting of chicken pieces: the technique of folding cold sliced meats and garnishing up on the mirror. Kazbar have introduced 6 training programes on DVD or seperate videos, which allows you to get some great ideas. Each program in the series covers one specialised topic, and shortcuts the time you spend training students or apprentices in a specific area. We have condensed the valuable accumulated experience of a professional chef in these special techniques - Food Garnishes and Presentation - into a series of six 30-minute programs. The DVD can be used to train staff in snatches of spare time and achieve a great deal of training quickly. Or, if you wish, you can use them in conjunction with your own training plan by using the video demonstrations as a starting point and adding your own knowledge and insights after these techniques are shown. This DVD program has been successful and is in demand because every technique is explained and demonstrated so that the student / apprentice or home entertainer can use it right away. To make food appealing and to create an impressive table. To show methods for good presentation that are less wasteful than many others. The techniques shown on the programs create edible garnishes, not throwaway items. In addition, some garnishes are reusable in salads and soups - or the stockpot. The less time-consuming techniques have been selected. The programs show effective presentation techniques using the same food you are planning to serve, presenting it to maximum effect. The techniques demonstrated throughout the program have been created by Barry Wells, a noted Australian Chef with 40 years experience in a variety of organisations and, as a businessman with his own catering company. Here he has put together the know-how on presentation that a chef can accumulate in a long and busy career. He shows the unique approach he's developed to this vital element of food preparation: The speedy preparation of edible garnishes, covering the full range of items and occasions. It is a stylish yet practical approach that can be used in a variety of settings, and for all occasions.